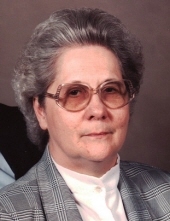 Mary Frances James, age 82, of Madisonville, KY passed away on Sunday, December 2, 2018 at Linda E. White Hospice in Evansville, IN. Mrs. James was born on June 11, 1936 in to the late James Rogers Bryant and Georgia Lee McCraw Bryant in Montgomery County, TN. She worked at Ottenheimer Manufacturing for many years and was of the Pentecostal faith. Mrs. James is survived by a daughter ~ Debbie Littlepage of Madisonville, KY; a son ~ Robert Jason (Susan) James of Hanson, KY; a sister ~ Betty Jean Bove of Washington state; six grandchildren ~ Tammy Davis, Rodney Brasher, Victoria Arnold, Dustin James, Alison Lee and Robbie James; six great-grandchildren ~ Peyton Brasher, Aubree Arnold, Kenzlee James, Aayden James, Kobe James and Annalee Arnold. She was preceded in death by her parents; her husband ~ Robert Lee James (departed 1/22/1999) an infant daughter ~ Susan Elizabeth Greenfield; a great-grandson ~ Chan Joseph “CJ” Davis; five brothers ~ Jessie Bailey Bryant, James Lester Bryant, Robert Lewis Bryant, Brandon Ray Bryant, and James Rogers Bryant, Jr.; and two sisters ~ Minnie Lee Bryant Davis and Bernice Mae Bryant Bowen. Visitation for Mrs. Mary Frances James will be Wednesday, December 5, 2018 from 12:30 -2:30 PM at Beshear Funeral Home in Dawson Springs, KY. A Funeral Service will be conducted on Wednesday, December 5, 2018 at 2:30 PM at Beshear Funeral Home with Rev. Ron Hendricks officiating. Burial will follow in Rosedale Cemetery in Dawson Springs, KY. Active Pallbearers will be Dustin James, Bill Davis, D.J. Arnold, Robbie James and Jason James. To send flowers or a remembrance gift to the family of Mary Frances James, please visit our Tribute Store. "Email Address" would like to share the life celebration of Mary Frances James. Click on the "link" to go to share a favorite memory or leave a condolence message for the family.